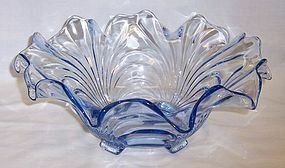 This really pretty Moonlight Blue Caprice Alpine 4 Footed Oval Ruffled Bowl was made by Cambridge Glass. This Bowl measures 12 1/2 inches wide X 10 inches across X 4 inches high. It is in very good condition with no chips, cracks or scratches. Be sure to search our other Caprice available. We guarantee items to be as described. THANK YOU. This really pretty crystal clear Diane, Etch No. 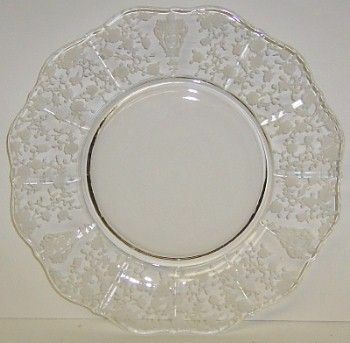 752, Five Part Divided Relish Tray or Platter was made by Cambridge Glass from 1931 to 1956. 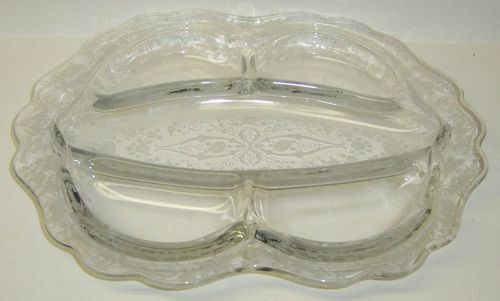 This Relish Tray measures 12 1/4 inches wide X 10 1/2 inches across X 1 inch high. It is in very good condition with no chips, cracks or scratches. Be sure to search our other Cambridge Glass available. We guarantee items to be as described. THANK YOU. 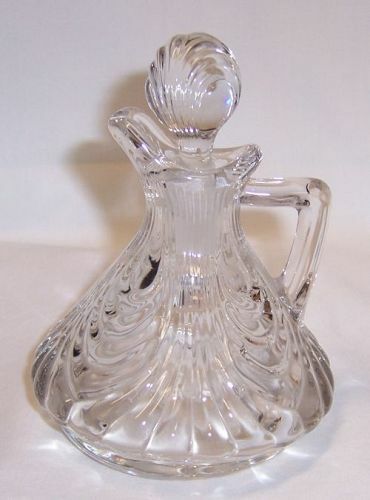 This is a really nice, vintage, crystal clear Caprice Oil or Vinegar Cruet with Stopper made by Cambridge Glass. The Cruet measures 4 3/8 inches high to top of stopper. Both the Cruet and Stopper are in very good condition with no chips or cracks. Be sure to search our other vintage Caprice available. We guarantee items to be as described. THANK YOU. 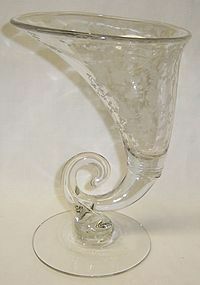 This is a really pretty crystal clear Chantilly 6 inch high Bud Vase made by Chantilly Glass. This vase measure 2 inches in diameter at the top and is in very good condition with no chips, cracks or scratches. Be sure to search our other vases available to decorate your home. We guarantee items to be as described. THANK YOU. This really pretty pink Cleo 6 1/4 inch high X 3 5/8 inch diameter Footed Tumbler was made by Cambridge Glass. This Tumbler has a crystal base with the Number 3035 stem. It holds 10 ounces and is in very good condition with no chips, cracks or scratches. Be sure to search our other Cambridge available. We guarantee items to be as described. THANK YOU. 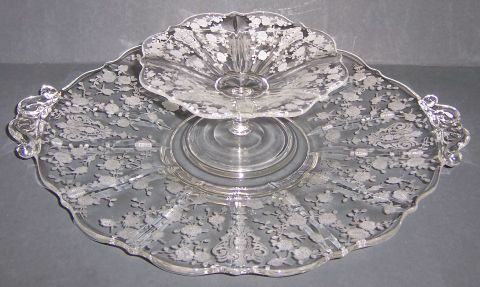 This beautiful crystal clear Rose Point 8 Inch Salad Plate was made by Cambridge Glass. This Plate is in very good condition with no chips, cracks or scratches. The yellow streak on the plate is from the flash. Be sure to search our other Rose Point available. We guarantee all items to be as described. Feel free to email with any questions. THANK YOU. This really pretty Willow Blue Decagon Ice Pail or Ice Bucket was made by Cambridge Glass. This Ice Pail measures 5 inches diameter X 3 1/2 inches high. It is in very good condition with no chips, cracks or scratches. Be sure to search our other Cambridge available. We guarantee items to be as described. THANK YOU. 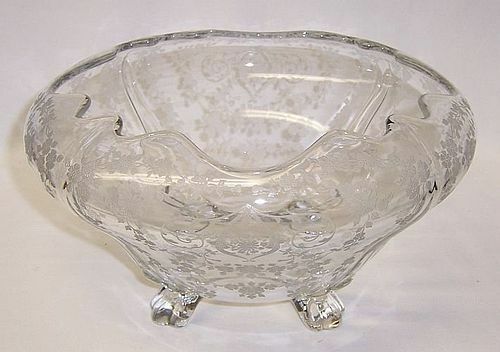 This really pretty crystal clear Wildflower 11 1/2 inch 4-Footed Console Bowl was made by Cambridge Glass. This Bowl is 4 inches high and is in very good condition with no chips, cracks or scratches. The shading in the picture is from the flash and is not in the bowl. Be sure to search our other Cambridge glass available. We guarantee all items to be as described. THANK YOU. This really pretty crystal clear Diane, Etch No. 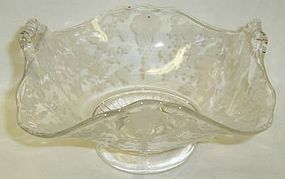 752, 3400/135 Four Footed Cupped Bowl was made by Cambridge Glass from 1931 to 1956. This Bowl can be hard to find. It measures 9 1/4 inches at the widest diameter X 5 inches high. It is in very good condition with no chips, cracks or scratches. We guarantee items to be as described. THANK YOU. 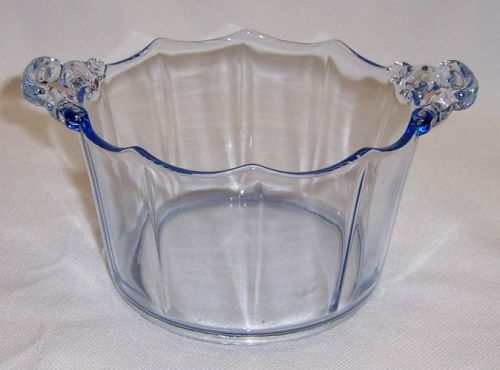 This is a really pretty crystal clear Rose Point Number 3500/55 5 3/4 Inch Gadroon Footed Crimped Two Handled Basket was made by Cambridge Glass. This Basket measures 3 1/2 inches high and is in very good condition with no chips, cracks or scratches. Be sure to search our other Rose Point available. We guarantee items to be as described. THANK YOU. 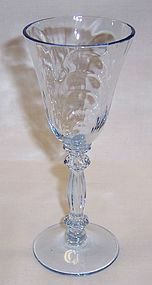 This is a really pretty crystal clear 9 Inch high Rose Point Number 3121 Cornucopia Vase made by Cambridge Glass. This Vase is in excellent condition with no chips, cracks or cloudiness. Be sure to search our other Rose Point available. We guarantee items to be as described. Feel free to email any questions. THANK YOU. 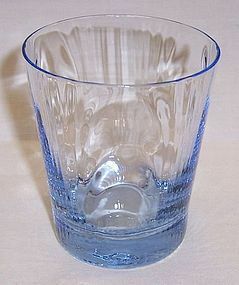 This really pretty Moonlight Blue Caprice 7 Ounce Old Fashion Flat Tumbler was made by Cambridge Glass. This Tumbler measures 3 1/4 inches high and is in very good condition with no chips, cracks or scratches. Be sure to search our other Caprice available. We guarantee items to be as described. Feel free to email any questions. THANK YOU. 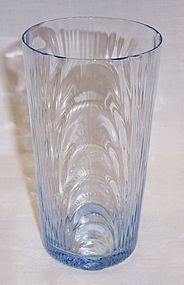 This really pretty Moonlight Blue Caprice Number 310 5 1/4 inch high flat Ice Tea Tumbler was made by Cambridge Glass. This Tumbler is in very good condition with no chips, cracks or scratches. Be sure to search our other Caprice available. We guarantee items to be as described. Feel free to email any questions. THANK YOU. This really pretty Moonlight Blue Caprice 5 3/4 inch high Liquor Cocktail was made by Cambridge Glass. This Cocktail holds 3 ounces and is in very good condition with no chips, cracks or scratches. Be sure to search our other Caprice available. We guarantee items to be as described. Feel free to email any questions. THANK YOU. This really pretty Moonlight Blue Caprice 4 Footed Crimped Bowl was made by Cambridge Glass. This Bowl measures 11 across and is in very good condition with no chips, cracks or scratches. Be sure to search our other Caprice available. We guarantee items to be as described. Feel free to email any questions. THANK YOU. This is a really pretty crystal clear Rose Point No. 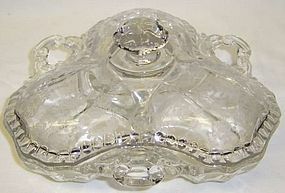 3500/57 8 Inch 3-Part Candy Box with Lid was made by Cambridge Glass. Both the Candy Box bottom and lid are in very good condition with no chips, cracks or scratches. Be sure to search our other Rose Point available. We guarantee all items to be as described. Feel free to email any questions. THANK YOU.